There are plenty of people in the world who love the idea of camping. They would love spending time around the pool or the campfire and would enjoy the company of other campers. They may not be wild about the idea of buying, storing, cleaning, and repacking the gear. Or maybe they only have two or three days in the middle of the week to get away. These are the people who love cabin camping the most. You get all there is to enjoy in the campground without all the work. Our cabins are a little home away from home. when you book a cabin you’ll just need to bring bedding, linens, food, and clothing. You can be set up and ready to explore within an hour of arrival. It is also the perfect option for young families who would like to visit with their RVing family members who don’t have room in the rig. We have two cabins for this very reason. They each have a double bed and a set of bunks. You can bring regular bedding or sleeping bags and pillows. They are close to the main bathhouse, have a picnic table and fire ring. There is a ceiling light/fan and a fan to keep you cool in the warmer months. Not everyone is interested in setting up and tearing down their tent, popup, trailer or RV. These cabins are for all of you who would like to make your stay as simple as possible or those who want to test out the camping experience before they commit to purchasing a camping vehicle. 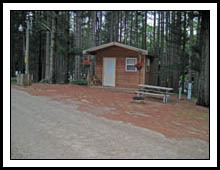 You can see photo of our cabins by clicking here: Holiday Camping Resort Cabin Rental. We’d love to see you this summer so make your reservations early. The cabins book up quickly and we don’t want you to miss the chance to have the best camping vacation ever.